"Sally Mae Not", Boston Phoenix , November 28 - December 4, 2003. "Older Americans Going Deeper in Debt", AARP , March 2003. "Charge It, Santa Baby. ", Newsweek, Dec. 23, 2002. "Credit Cards for College Kids", Smart Money , July 11, 2002. "Don't Leave College Without It: Universities are cutting big-dollar deals with credit card companies, and students are paying the price. ", Mother Jones, March/April 2002. 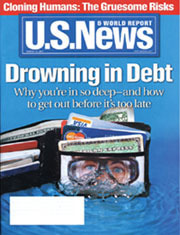 Cover Story, "Drowning in Debt in America", U.S. News and World Report, appeared on March 19, 2001. On-line version available. "BIG CARDS ON CAMPUS: Affinity-card issuers are stepping in with megabucks" Business Week, Sept 20, 1999, pp. 136-138. Interview with Ben Merens, WPR Radio , January 8, 2004. Interview with Mike Thorton on Predatory Lending, The League of Revolutionaries for a New America , October 15, 2003. A Nation in Debt: Interview with All Things Considered guest host Lynn Neary, NPR , Jan. 29-31, 2003. Interview with Jean Feraca, WPR Radio , December 27, 2001.
Credit Card Season, ABC Australia, December 5, 2001. Interview "Is Our Economy a House of Cards? ", Sound Money, November 3, 2001. (radio interview available on site, requires Real Audio player). Dr. Manning's C-Span lecture on CREDIT CARD NATION, filmed at VERTIGO BOOKS, College Park, MD on January 25th is available at the on-line C-Span store. "Consumer Credit", Talk of the Nation, National Public Radio, February 20, 2001. (broadcast available on site, requires Real Audio player). WAMU, Diane Rehm Show, January 22, 2001, 10 a.m.
"Credit Cards on Campus," Enough Magazine, Center for A New American Dream, Fall 2003:1, 8-9. "Credit Card Companies Target Teens: Teens Still Spend In Rough Economic Times", ClickOnDetroit , September 24, 2003. "New card makes credit a present", The Indianapolis Star, December 13, 2002. "Covering More than the Price of Admission", Washington Post, April 28, 2002. "DIPLOMAS COME WITH DEBT", Washington Times Weekly, March 5, 2002. "Retailers have stake in how young adults deal with debt Spending habits will shape many futures", Detroit News, March 8, 2002. "Young consumers: Indebted to the future", Miami Herald, March 8, 2002. "College grads face crushing debt -- and recession", South Coast Today, January 13, 2002. The Pitfalls of Credit Card Abuse, The Black Collegian , 2002. "Few campuses offer students debt counseling", Cincinnati Enquirer. September 19, 1999. "Credit Conundrum" ABCNNEWS.com, June 20, 2003. "High college costs can be overcome: Students can jump tuition hurdles by taking the right freshmen steps" DetNews.com, May 5, 2002. "Credit addiction goes global America's latest cultural export is the buy-now, pay-later shopping habit", U.S. News Money & Business Story, March 25, 2002. 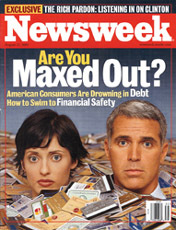 "Young consumers face a world of debt", MSNBC.com, March 8, 2002. "Digging a hole: Young consumers rack up massive credit card debt" MyInky.com, March 8, 2002. "Can the Fed Rescue the U.S. Economy or Not? ", Common Dreams News Center, January 16, 2002. "Chained to Debt", Real Change News.org, October 4, 2001. "Credit-Card Capers", Insight on the News, August 20, 2001. "Student loans let youths study now, pay debt later", Bankrate.com, September 21, 2001. "The debtor generation", Bankrate.com, September 21, 2001. "New Generations: Credit cards for college students a big business", staugustine.com, September 9, 2001. "Debt Smothers Young Americans", Claritas, Inc.
"Our Addiction to Credit", LiP Magazine, Interview by Silia J. A. Tilvi, July 23, 2001. 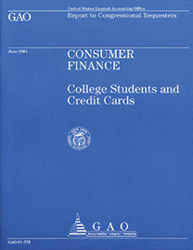 "Students pay when campuses benefit from credit-card solicitations", gmToday, April 16, 2001. "Generation Bankrupt" Salon.com, April 12, 2001. "Lingering Debt Is Warning Signal", Associated Press, March 1, 2001 (posted on Northern Lights). "Charge it", Sub-Board I - U. of Buffalo, February 27, 2001. Guest of Michelle Singletary on the Washington Post.com Live Online web chat on the "Color of Money: Debt Free by 2003" on Tuesday, February 27, at 1:00. "Credit cards lure young women beyond their means", smh.au.com (Sun Herald), December 9, 2001. "Card debt hardship soars", The West Australian, December 7, 2001. "Credit Card Season", ABC Western Australia, audio interview available, December 5, 2001. "More young women graduates go bankrupt in Australia" StraitTimes, December, 2001. "Record debts question whether the plastic is so fantastic" The Sun-Herald/The Sydney Morning Herald, September 8, 2001. "Credit Card Issuers Prey on Students", Taipei Times, August 29, 2001, republished on Taiwan.com.au, "A cultural and business conduit between Australia and Taiwan..."
"Debt Smothers Young Americans", Business Line, Financial Daily from THE HINDU group of publications, July 30, 2001. "Students destroyed by credit card debt", The Daily Dispatch Online, South Africa, June 10, 1999. "Students accrue debt with pizza, gum Credit companies get students to sign up, spend much more than original purchase", The Lumberjack - Online Edition, Humboldt State, September 27, 2001. "Credit card debt: It’s everywhere you want to be", The Arkansas Traveler, February 2, 2001. "Protect yourself from credit problems" The Student Voice Online News, March 2, 2000.